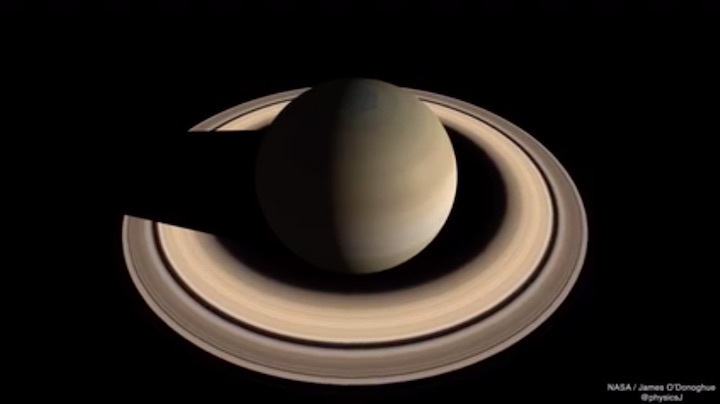 Saturn’s icy rings are among the most iconic features in the solar system. But they’re raining so much water onto the planet that in 300 million years they could rain themselves nearly out of existence,leaving Saturn startlingly ringless. “What we’re seeing is something on the order of about a ton and a half per second,” said James O’Donoghue of NASA’s Goddard Space Flight Center, in Greenbelt, Md., who reports the conclusions Monday in the journal Icarus. 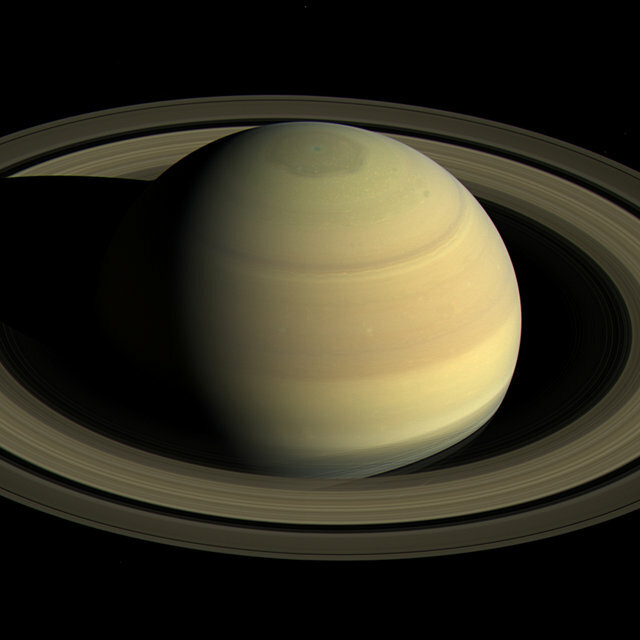 It’s difficult to imagine a solar system without Saturn’s rings, but it turns out they are an ephemeral, if majestic, phenomenon. Scientists have long debated the age and expected life span of the rings, and last year, some published findings suggesting that they are not ancient relics from the birth of the solar system, 4.5 billion years ago. Instead, they were fastened onto Saturn within the last few hundred million years — during the time of the dinosaurs. And now, multiple lines of evidence are converging to suggest that the rings come with an expiration date. Stretching some 175,000 miles across, Saturn’s bangles easily outshine the dark, fragmented rings feebly encircling Jupiter, Uranus and Neptune. In fact, without its icy accouterments, Saturn would look boring and beige compared to some of the other gas giants. Dr. O’Donoghue and his colleagues suggest the rings could wither away in the near future, on the relative scale of solar system time. Earlier this year, the team took a close look at measurements of a charged molecule found in the upper reaches of Saturn’s yellowish atmosphere, using the Keck II Telescope in Hawaii in 2011. The molecule, H₃⁺, is made up of three hydrogen atoms (minus an electron). It is created in abundance when minuscule, charged particles escape Saturn’s C-ring, spiral into the planet along magnetic field lines and collide with atmospheric atoms in what is called ring rain. After measuring the amount of H₃⁺ in Saturn’s upper atmosphere, Dr. O’Donoghue and his team concluded that as much as 4,400 pounds of water are falling onto Saturn each second. Assuming a constant rate of ring rain — which Dr. Spilker said is a substantial unknown — the team calculated that Saturn’s rings could mostly shed themselves into oblivion within 300 million years. “It’s not out of the question, I would say, that the rings might degrade on this kind of time scale,” said Jeff Cuzzi of NASA’s Ames Research Center in Moffett Field, Calif., who was not involved in the research. But, he added, “it doesn’t mean that if you come back, there would just be nothing there.” The rate at which the rings might waste away depends not only on how much material is still in the rings, but on other physical forces, Saturn’s shifting seasons and the way in which ring material is replenished. Recent research using data from the Cassini spacecraft, which winged its way among Saturn and its moons for more than a decade, support the group’s ring rain estimate. Before Cassini took a fiery, fatal plunge into Saturn in September 2017, it completed a daring series of loops between the planet and its rings. The spacecraft took a census of the particles it encountered that were falling toward the planet; the amount of ring rain Cassini caught is “completely consistent” with Dr. O’Donoghue’s measurements, Dr. Spilker said. But Cassini also found that a colossal amount of organic molecules and water ice (on the order of 22,000 pounds per second) are falling onto the planet’s Equator through a different, potentially transient process that could help hasten the rings’ demise. That could mean the rings might disappear even sooner, in less than 100 million years, Dr. O’Donoghue said. Although Dr. Cuzzi is skeptical of the time frame in the new study, he agreed it is likely that the rings will gracefully degrade as the solar system matures. “I don’t think it’s unreasonable, with all these numbers being so high, that we have to seriously consider that the rings won’t be around forever,” he said.